As part of an ongoing project to interview all 50 of Chicago's aldermen about sustainable transportation issues in their districts (previously: 27th Ward Ald. Walter Burnett Jr.), I recently caught up with Scott Waguespack at the 32nd Ward service office, 2657 N. Clybourn. His ward includes parts of Ukrainian Village, Wicker Park, Bucktown, Goose Island, Lincoln Park, Lakeview and Roscoe Village. In 2007 Waguespack defeated Richard M. Daley-backed incumbent Ted Matlak and soon gained a reputation as an independent voice in City Council. Most famously, he was the leading critic of Daley's push to privatize the city's parking meters, a move that the former mayor would eventually admit, "we totally screwed up." 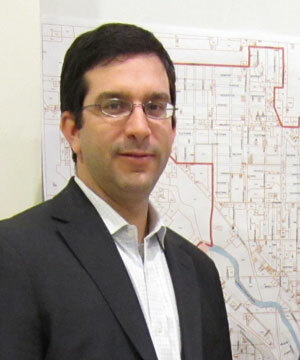 Waguespack is also known as one of the city's most bike- and transit-friendly aldermen. We talked about his commuting habits; his efforts to promote biking and transit use in the ward; plans for developing the Bloomingdale Trail; and his far-fetched idea of connecting his district to the Loop via water taxi. You just rode the train here from the Loop? Yes. It took a little while. I took the Blue Line to Western. I usually park my car near Western or Damen, since I live right there. So I leave the car, take the train downtown to City Hall, pop back up and then drive over here to the ward office. But I have to go through the [notoriously congested] Damen/Elston/Fullerton intersection to get here, so that slows things down. What's going on with the reconfiguration of that intersection? We're pretty much done with the planning. IDOT [Illinois Department of Transportation] and any of the federal guys that were looking at the plan, they've signed off on everything. What it really boils down to is negotiating with the property owners that are going to be affected. But two or three of the businesses are already moving on to the next stage. Like Midtown Tennis, they're going to lose the northern half of their business and they're already moving on to rebuilding the south side. We did get input from a few people from Active Transportation Alliance and some guys from CDOT [Chicago Department of Transportation], like [Bicycle Program Coordinator] Ben Gomberg, who are really big cyclists. They were involved with some of the planning, so we made sure the redesign includes bike lanes, even though it's kind of a challenging intersection. Are they going to be protected bike lanes, like Kinzie Street, or just conventional, paint-on-the-road, bike lanes? They're still working on design. Elston will be protected, maybe not quite like Kinzie, but as Elston loops around, cars could potentially pick up more speed, so they did want something to provide better protection for cyclists. Do you do much walking? Yeah, around the ward. But during the summer my staff and I are more likely to get around by bike. Two or three of us go up and down the areas, just checking out a sinkhole, going to one of the school meetings, things like that. Once in a while I'll ride downtown, but not as much. In the winter, hitting some of the residential areas or some of the business strips like Roscoe or Lincoln, we'll end up doing that on foot. I've kind of scaled back over the years on winter cycling. I've got a Gary Fisher mountain bike with slicks on it. And I've got an old Schwinn that's kind of a beater bike, just in case I'm going somewhere that I might lose it. Just some old, beat-up stuff that I've collected over the years. Do you lead a bike tour of the ward? Yeah. We get around 20 people, which is a good, manageable size. We don't have to shut down the streets or anything. We usually start out near Kathy Schubert's place on Webster in Lincoln Park. [Schubert is a long-time bike activist who led a successful letter-writing campaign to petition CDOT to make some of Chicago's metal-grate bridges more bike-friendly by installing non-slip plates, now nicknamed "Kathy plates."] We'll go to the Ukrainian Village area to check out the churches, kind of zing around up here through the industrial area and then hit some of the residential areas. Depending on who's leading the ride, if they have a not-for-profit in the ward we'll generally go to that place and tell people a little bit about it. So does Kathy lobby you a lot about bike issues in the ward? All the time. Mostly about where we need more bike lanes and about the bridges: the Halsted bridges, which are under construction, and the Division bridge, which will soon be under construction. And then whenever there are potholes, broken glass, that kind of thing, she's typically cruising around the ward and calling stuff in. So she's kind of the eyes and ears out there on behalf of cyclists. Speaking of Halsted, that bridge is going to have two lanes in each direction. Halsted is only one lane in each direction for most of its length, so why will it be double width there? Part of the reason they went with that design is that we wanted to make sure there was space for cyclists. The same issue is coming up with the Division bridge. The designs come from the engineers at CDOT. Every time a bridge is rebuilt we tell the engineers to make sure they put the nice plates on it, but that's pretty much the only thing I look at. Are there any walking, biking or transit projects coming up in the ward that you're particularly excited about? We've been trying to do one near the Brown Line stop at Lincoln and Paulina, trying to limit the amount of parking on the project to the most minimal amount and really push for a project that's pedestrian- and cycling-oriented. We've done the same thing at Damen, Milwaukee and North, and over the last few years we've really pushed back on people who want to load up that intersection with cars by jamming parking into new construction or putting in parking garages right at those intersections. Is there any movement towards changing the city's zoning code so developers aren't required to put in so much parking? Not at the city level. But in our ward we've said, we're not going to up-zone to allow for massive amounts of parking at these intersections. So anything that we re-zone around these intersections, the process starts out from a transit-oriented development viewpoint -- we draw that line right of the bat. Some of the other new aldermen have looked at our guidelines and we've been educating them on this issue. Over time we might be able to change the zoning code to eliminate the two-for-one requirement [the city's zoning code currently requires developers to provide two parking spaces for each housing unit in some types of buildings], because then you're just stacking cars and overloading an area. And if you look at Milwaukee and Lincoln, those are two of the areas of the city that have the highest amount of bicycling during the summer. Our other big effort there is bike safety, so we've been doing a lot of safety awareness events with the police and with the city's Bicycle Ambassadors. These include distributing bike lights and pulling over people who are riding against traffic or on the sidewalk, or busting through stoplights. We're paying attention to some of the big intersections where a lot of the conflicts occur. 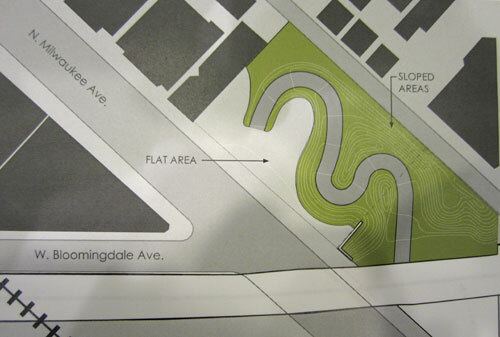 Have you attended any of the recent public input meetings for the Bloomingdale Trail? Yeah, we just had one to discuss the park and trail access point they'll be building at Milwaukee and Leavitt. We were talking about what people want to see go in there. Since you get such high bike traffic on Milwaukee, it's true that a few cyclists are going to use this spot to get up to the trail. But I think some people on the design team are looking at it as if all these cyclists are going to want to get up on the trail there and use it to commute to other areas. I don't really think that's true. If you're a commuting cyclist you're going to stick to the most efficient route [to and from the Loop], which is Milwaukee. If we see anybody biking up on the Bloomingdale Trail from Milwaukee I think it's going to be more of your Saturday casual riders and maybe a few people up there during the week. The space at Milwaukee and Leavitt is just a plain green space right now. What the design team came up with is a space that looks like this. [Shows a rendering of a wavy, contoured path, which occupies much of the available space, leading up to the elevated trail.] We looked at this and said, well the path takes up 75 percent of the actual green space. There's going to be a discussion about this with the neighbors. Some people would rather just throw playground equipment on the space. So that's all up in the air now, but we just started the conversation. What's going on with crime on the Bloomingdale Line - is that still an issue? You talked to Joan Fox [a Bucktown resident whose home abuts the Bloomingdale Line, for a 2009 Chicago Reader article discussing complaints from neighbors about vandalism and burglaries committed by people trespassing on the line.] I asked Joan and a couple other neighbors to be part of a taskforce that the city put together. They've been letting the design team know what the specific crime / homeless issues are. They are still pretty big concerns, so we need to make sure that those are taken care of first. That will probably be our number-one issue, as opposed to just the design of the trail. Other than what we've talked about, what are the most pressing transportation needs in the ward and what are your ideas to address them? One of the other things we're looking at is resurfacing streets. There are parts of Lincoln that need to be completely re-paved. Kingsbury is a huge issue down where SRAM [a bike component manufacturer, 1333 N. Kingsbury] is headquartered. There are railroad tracks that cause a lot of problems in terms of having smooth surfaces to either bike on, walk on or drive your car. And one of the things that I talked to the mayor about was that we all want to improve the bike lane markings. I approved about $60,000 this year out of menu money [each ward's roughly $1 million in discretionary funds] for re-striping lanes. [New bike lanes are usually installed with federal and state Congestion Mitigation and Air Quality Improvement grants, but this funding cannot be used to re-stripe existing lanes.] CDOT has been very good about telling us which lanes need re-striping, and I would sign off on those, after making sure we're not already planning to tear up the street afterwards. So re-surfacing and re-striping are probably the biggest things we need to do to protect cyclists. Is anything else interesting going on with transit in your ward? Other than the stations where we're looking at transit-oriented development, the other big one is Metra's Clybourn stop [located between Armitage and Cortland at Ashland/Elston]. We've been talking to Metra and CDOT, and we know it's a long-term wish, but we'd love to have it be more of a hub for buses. There was also talk of having the CTA Circle Line come over there. But we would like to see a new bus route on either Elston or Clybourn, and combine that with the Armitage and Ashland routes to create a hub with Metra. Since you have Metra and CTA converging here you have a lot of people who either walk to the station or ride their bikes there. Every day in the summer you see 20, 30 bicycles on the bike racks in front of the station -- they're jam-packed. In fact we've put in more bike racks there and we're probably going to put in even more there. We're talked to Metra about reconfiguring the whole station, and talking with the nearby property owners and CDOT to figure out a way to put in a bigger transportation hub there, one that's bike-friendly and bus- and Metra-friendly, just to kind of put all the pieces together. An idea that's a little crazier would be to have the water taxis come further up [to serve the station]. It's literally a two-minute walk from the river at Mendell Street and Cortland to the Clybourn station. There's a lot of ways you could have the water taxis come up and service some of the businesses here, so that's kind of our long-term outlook. It's a little outlandish but we put it on the table just as often as we can, just to remind people. So if somebody ever comes into a lot of money they might say, wait a minute, we'd have a perfect hub for people to stop here, especially during the summer, and take the water taxi downtown, and not have to deal with traffic. It's just a thought. John Greenfield is a Chicago-based writer covering sustainable transportation topics in the Windy City and beyond. He is co-founder of GridChicago.com and a regular contributor to Time Out Chicago, Newcity, Urban Velo and Momentum.